I was extremely excited to find a 1963 Chrysler Turbine car on display in the Chrysler area. The car has special memories for me. Interested in cars even as a youth I remember a person living in my neighborhood in Plymouth, Michigan having the use of a Turbine car. A sight I have never forgotten. 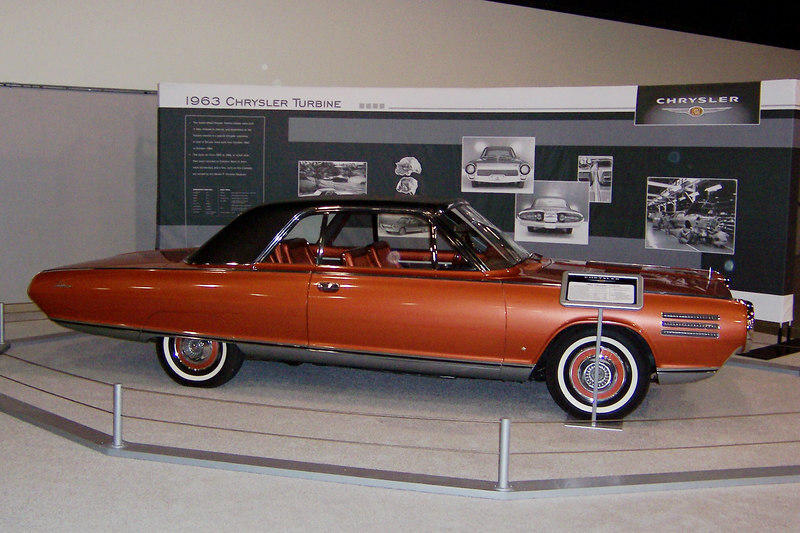 Chrysler Corporation built 50 turbine-powered cars and placed them in the hands of typical drivers for evaluation in everyday use and evaluation. Although the recommended fuel was diesel, the Turbine Car would run on ANY flammable liquid. At one point or another, Turbine Cars were run, without adjustments, on unleaded gas, kerosene, jet fuel, home heating oil, peanut oil, tequila and even Chanel No. 5. The cars were built at Chrysler Corporation's Engineering Research Laboratories in Detroit. At the assembly area, the Chrysler-designed car bodies, which are built by Ghia of Italy, were lowered onto the new engines and chassis components. The turbine engines were built and tested at Chrysler's Research Laboratories.